One of my favorite things to do when traveling to a new destination is to take a morning walk. My first-day plan is almost always the same: arrive, unpack, have a nice dinner, and go to bed early. Then, I’ll get up as the sun rises and start walking, without a specific agenda or address. I usually save the museums and palaces for later in the day. In the morning, everything is fresh and clean, the temperature is ideal, and it’s a good way to see local people go about their day. Plus, the light is beautiful. My favorite place to go in the morning is the market—whether it’s a vegetable market, flower market or in the case of Essaouira, Morocco, the vibrant fish market on the port. Luckily, Alexander+Roberts had arranged for a walking tour of the city, so I was able to gain insights into what I was seeing and experiencing in addition to taking photographs. 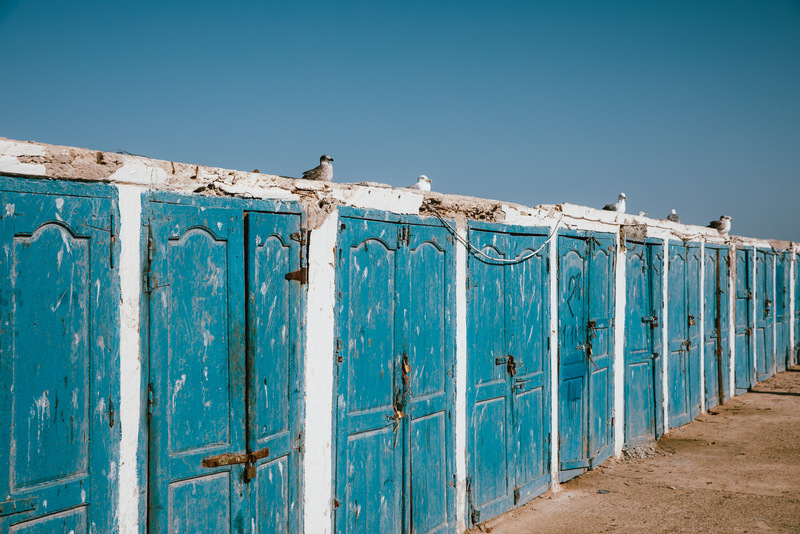 The first thing you notice about Essaouira are the seagulls. They’re everywhere. 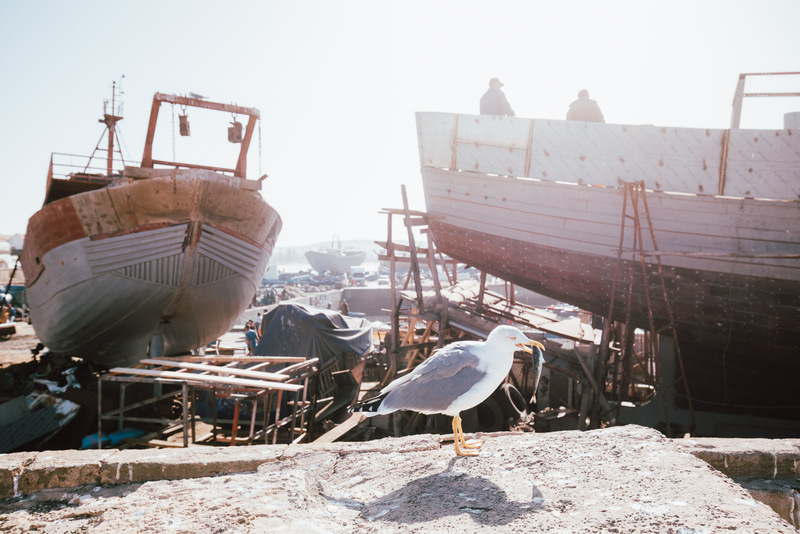 “Seagull Airport,’” said my guide from Alexander+Roberts, Mr. Hicham, pointing to a small island across the port where thousands of gulls were roosting. The port was packed and the fishermen were so busy that they barely noticed our group snapping shots of their every move. Our group hopped over muddy puddles on the street, made way for large trucks to get through and covered our noses when the smell was fish was overwhelming. But we were in good spirits and didn’t mind going a little out of the comfort zone for the payoff of an amazing local experience. Our visit coincided with the peak of sardine season. 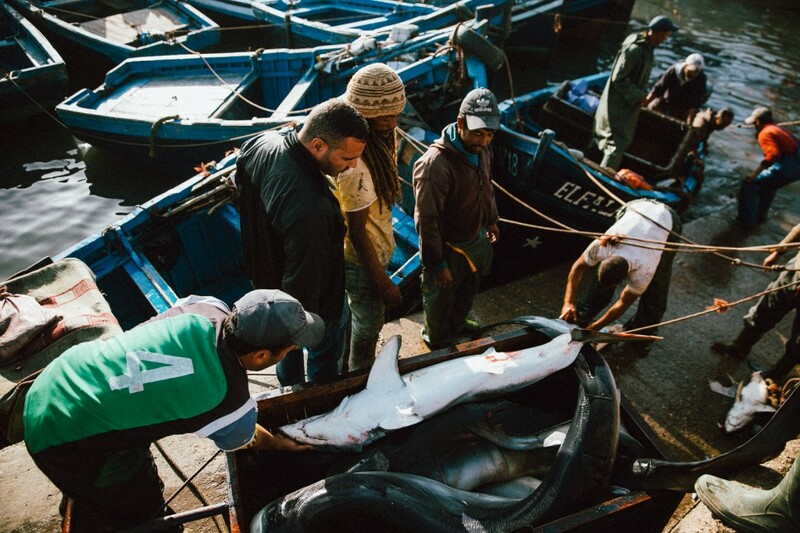 We saw dozens, maybe even hundreds, of small blue boats pulling in their catches and getting packed into trucks to be shipped to other parts of the country and abroad. The sardines are used for soups, stews or just grilled with salt. There were also eels, shrimp, crab, lobster, and dozens of types of fish. 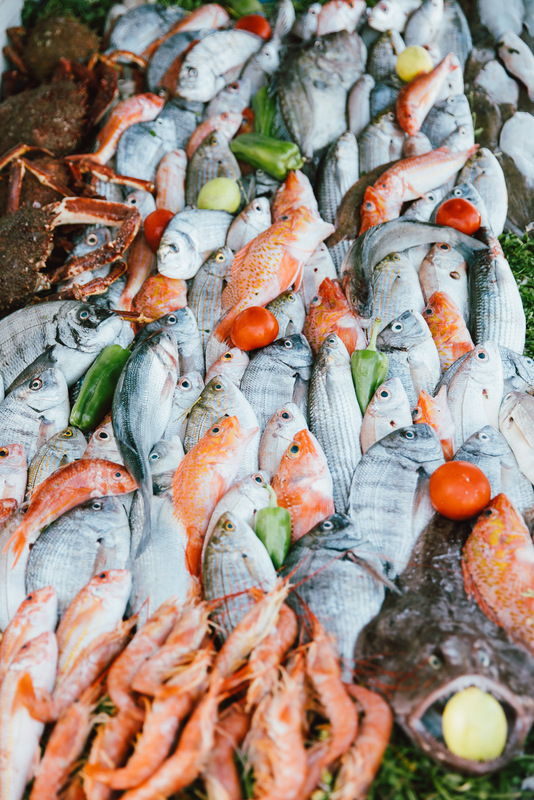 A row of blue painted food stalls at the entrance of the market displays the full selection and from there, you can handpick the seafood you want to eat and it’ll be cooked to your choice. 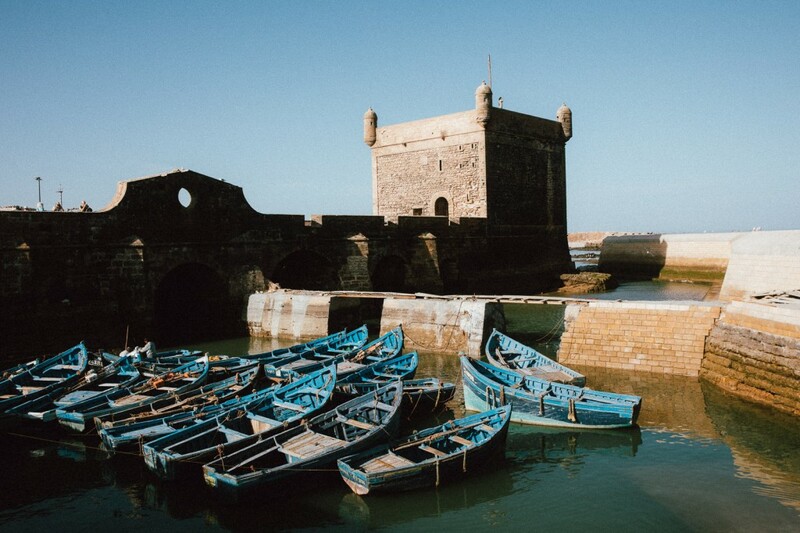 I had seafood at each meal of my time in Essaouira, and didn’t mind it a bit. 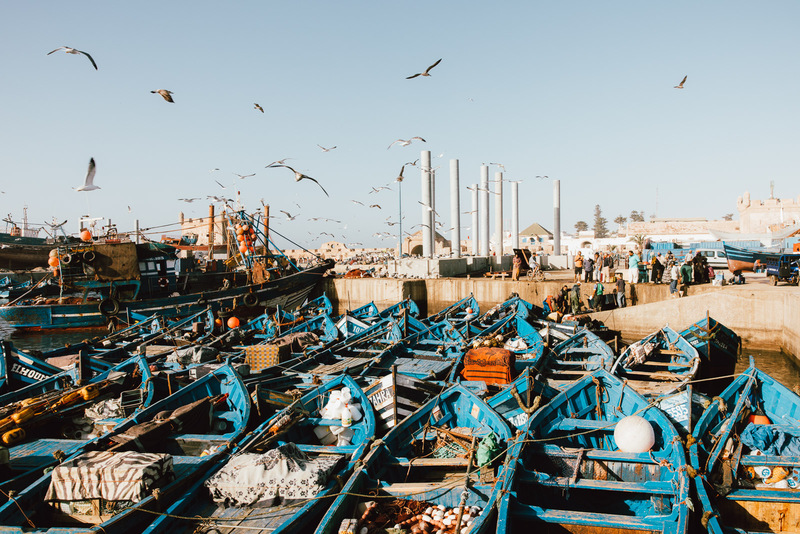 We had fish kebabs on skewers during our last meal at Il Mare, overlooking the Essaouira port we had just walked through. A bunch of us agreed it was perhaps the best meal of the trip so far, topped off with an unexpected and delightful chocolate cake. I decided to come back to the port one more time, to capture it in the warm, late afternoon light. I watched a boat pull-in carrying some really big fish. It took several people to just load it from the boat to the small tuk-tuk-like vehicles with a truck bed in the back. Upon closer look, I realized they were carrying sharks. This time there were no tourists around, so the locals quickly recognized me snapping shots at the scene. I caught someone saying in Arabic that I was a “professional,” and the crowd parted so I could get a better view. Some of the young men even smiled for photos. It was a strange feeling because here was a thing these fishermen did every day, catch big fish like sharks from the sea and transport them in the bed of a truck, like it was no big deal at all. They did this in order to make a living, while I was the passing tourist taking photos. This is one of the reasons I love Morocco. 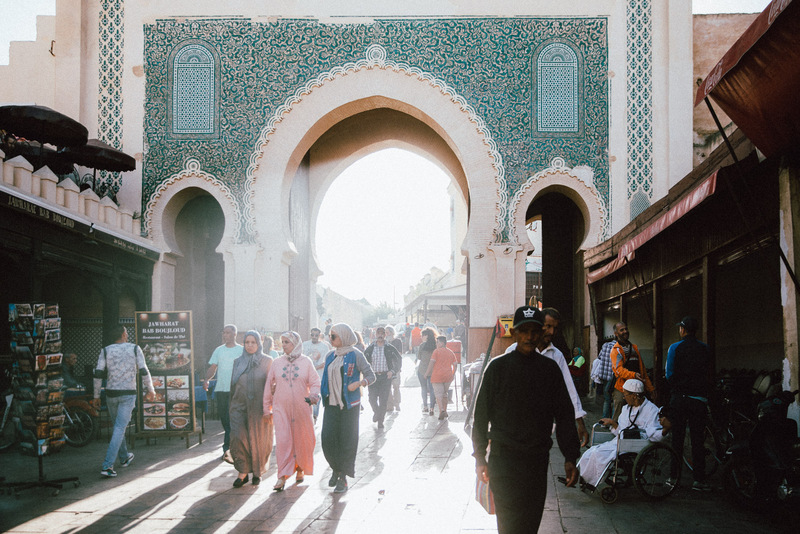 You can visit the treasures in palaces and go shopping in the touristy souks — and you should — yet there’s still plenty of everyday life and culture to be experienced in other areas as well. Interested in learning more about Tanveer’s journey? 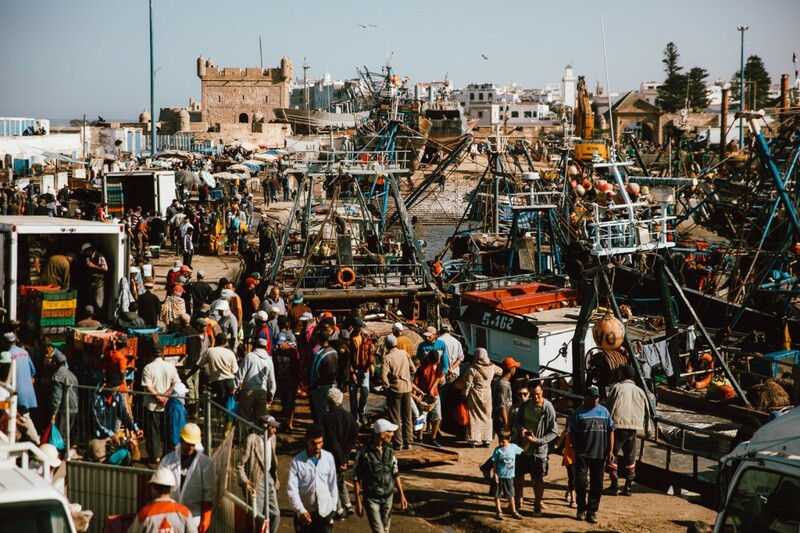 Read more about it on AFAR.com the USTOA blog and check out Alexander+Roberts’ Morocco…From Sea to Sahara. Tanveer is a travel, hotel, and lifestyle photographer who has explored more than 50 countries. Some trips have led him to photograph luxury hotels on the Amalfi Coast or the Riviera Maya, while others have taken him on long treks in the Bhutanese Himalayas or in search of lemurs in Madagascar. His wife, Kelly, a travel writer, often joins him on these adventures. This October, I had a chance to travel to Morocco with luxury tour operators Alexander+Roberts as an ambassador of AFAR magazine. This was my second visit to a country I’d already fallen in love with during a trip in 2014. One of the reasons I was particularly excited to return was to get a chance to further explore the ancient labyrinth of the Fez medina, the oldest walled-in part of Fez, Morocco that was built somewhere between 789 and 808 AD as the capital of the Idrisid dynasty. 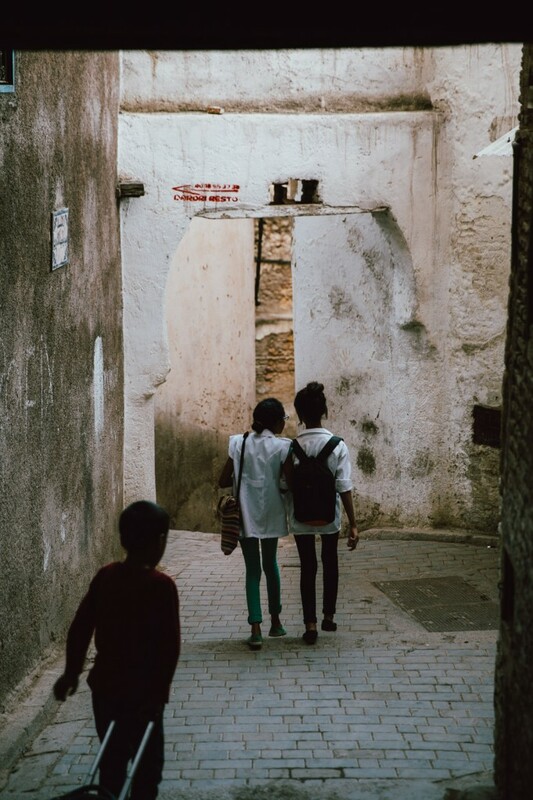 The last time I was here, I spent a week getting lost in the medina—sometimes deliberately, sometimes not—but I felt I’d only scratched the surface of the 9000+ alleyways, narrow streets, and lanes. 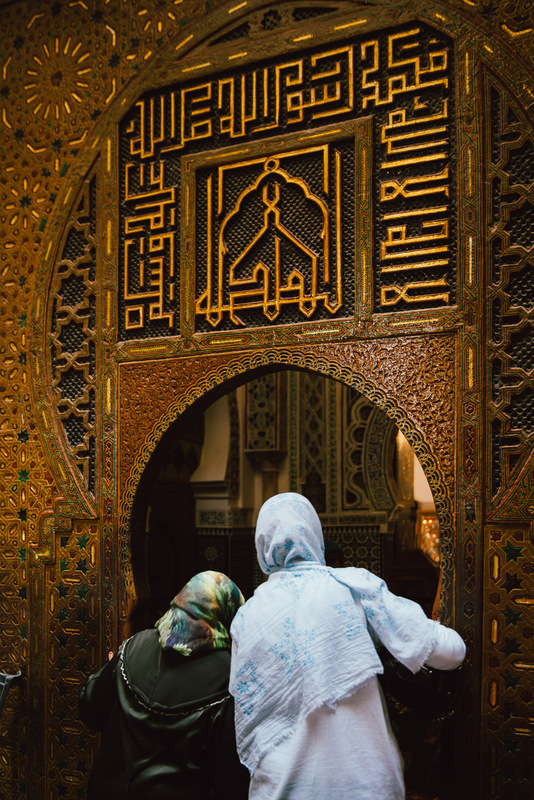 As a traveler, I don’t know if it’s ever possible to really get to know the medina, but I had to come back and explore. The walled city is a UNESCO site and is considered the world’s largest car-free urban area. 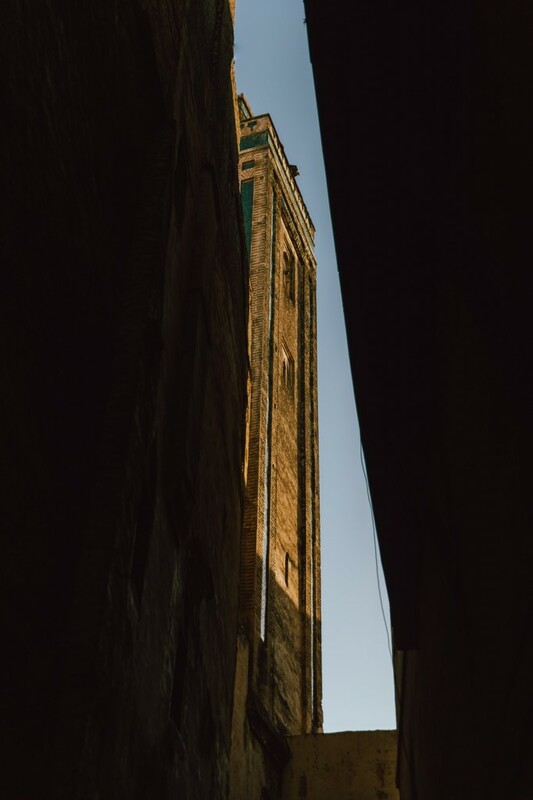 If you’ve ever walked the lively yet ancient streets of Varanasi, India or Venice, Italy, the Fez medina is a similar experience. As a photographer, entering the medina is love at first sight. There’s just so much action happening all at once. 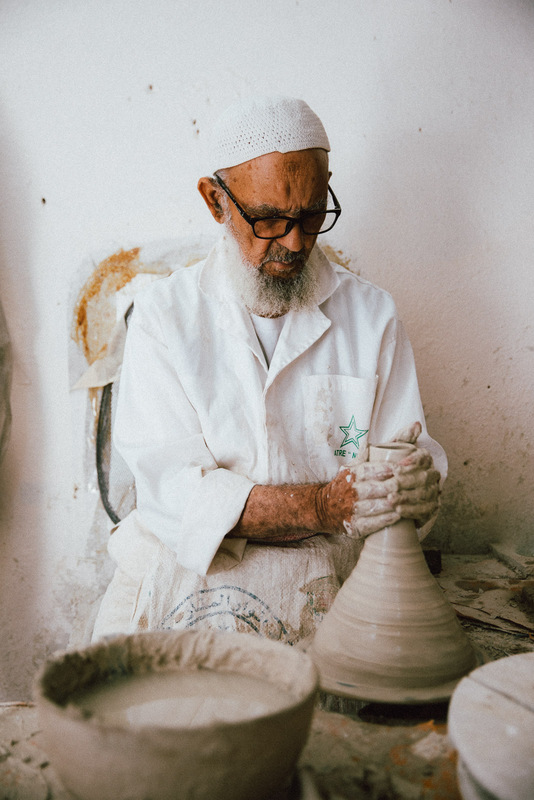 I pushed my back against the wall to let a donkey carrying hundreds of gallons of water bottles pass me with inches to spare; peeked into an open door to watch sparks fly from a blacksmith’s workshop; took in the aroma of lamb and prunes cooking in a tagine pot right there on the street. There’s no point in trying to remember the twist and turns you take as you walk the streets; you can get confused in minutes. The best thing to do is to hire a local guide to lead you through the maze. (After all, I wanted to get blissfully lost, but still have a way to get back easily). Alexander+Roberts had arranged for a local guide to show me locations that went beyond the guide books. 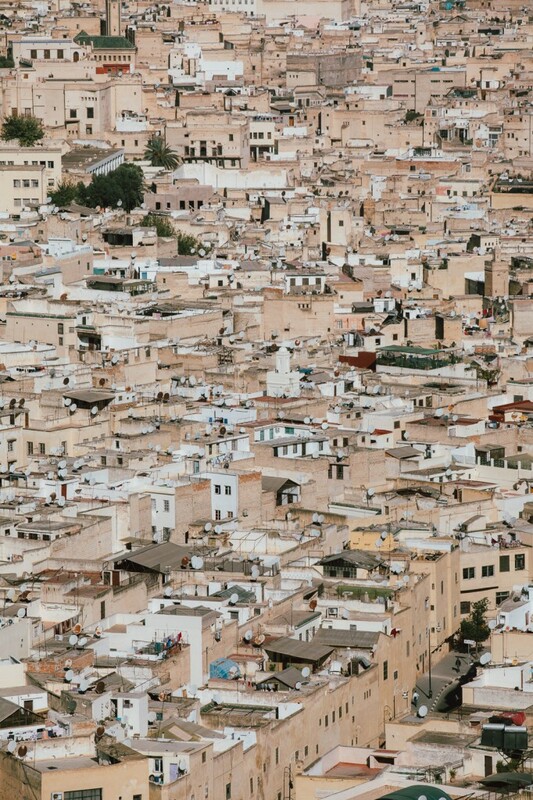 My guide, Mohammed, is one of these residents of the Fez medina. He seemed to know everyone we passed. He took me away from the crowded souks filled with tourists and plastic souvenirs to a much quieter part of the medina. At one point, as I was composing a photograph in a teeny alleyway barely large enough for a single person to walk through, I heard the scraping of several sets of sandals against the cobblestone. 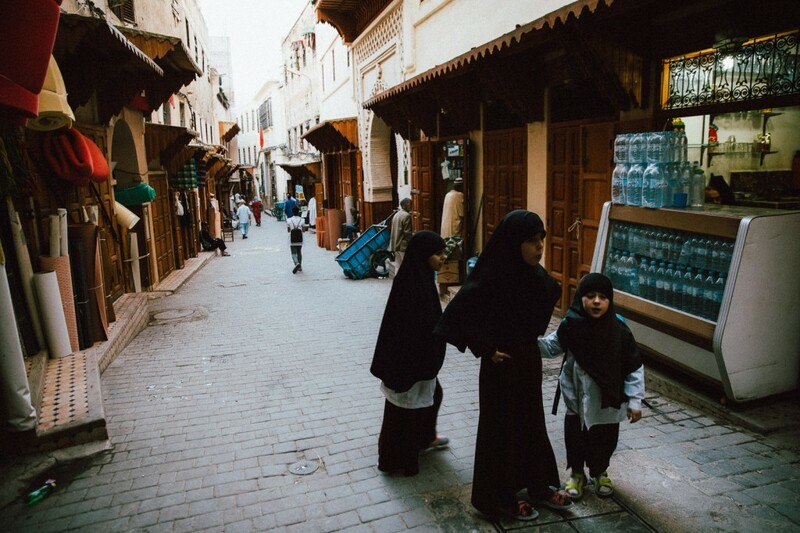 Suddenly a handful of children wearing hijab and colorful backpacks walked through my shot, smiling and giggling. After passing me, they looked back and waved to see if I would take their photo. 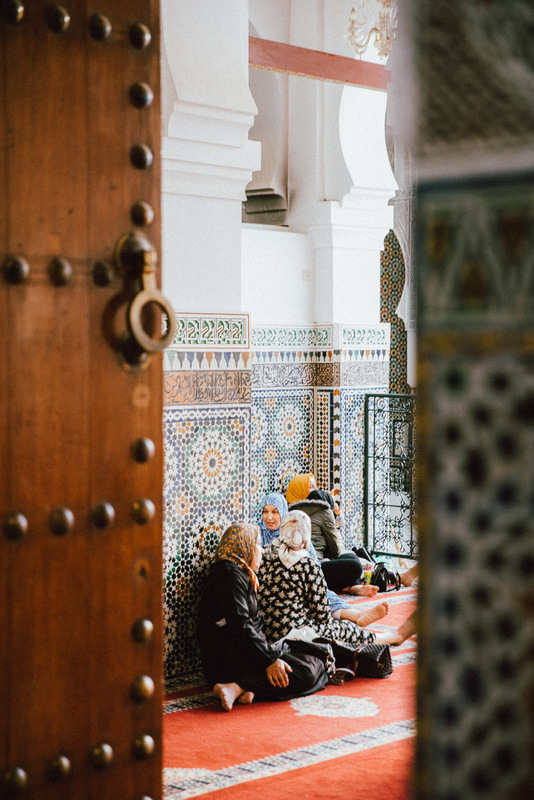 Unlike the more popular and heavily touristed medina of Marrakesh, I’ve found the Fez medina to be more residential, a place where everyday life happens right in front of you. 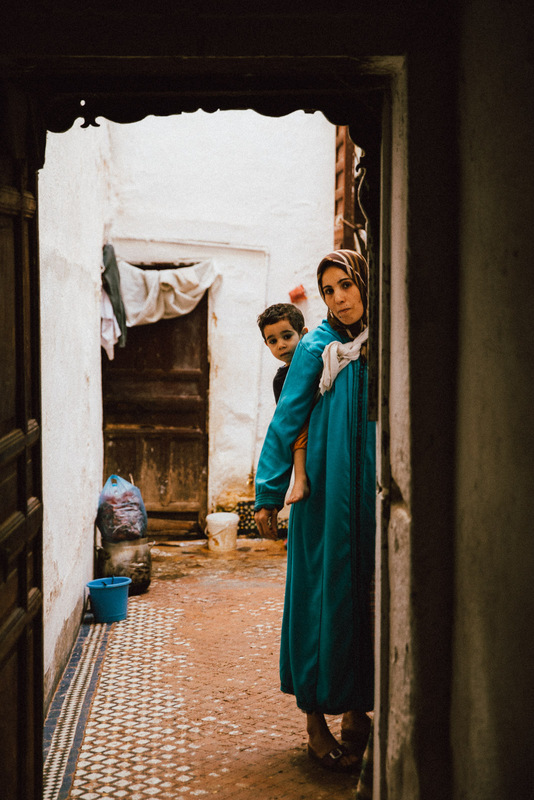 Since the residents live in such closer quarters, you can literally peek through the doorways and get a glimpse into their life — women cooking, men getting haircuts, children kicking around a soccer ball. In fact, more than 150,000 people choose to live here. One of the reasons I love exploring the medina is that it’s as far away from my everyday life in Los Angeles that I can imagine. And yet, everything just feels totally natural. Mohammed took me to Quranic madrasas (Islamic schools), pointed out the remains of an ancient arch, and the view of a mosque slicing through a tiny crack between alleyways. “Everyone in Fez knows Mohammed. If you’re missing your wallet, in five minutes, Mohammed will have your wallet back,” another guide from Alexander+Roberts, who had connected me to Mohammed, told me. 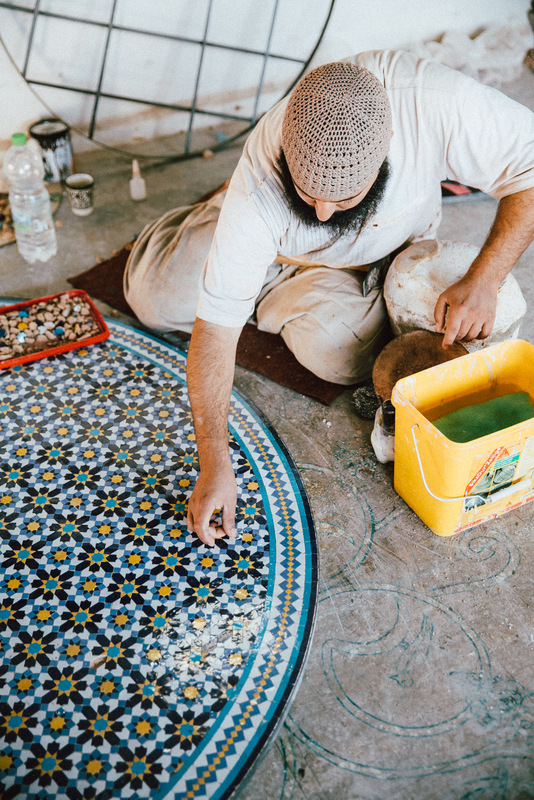 Interested in learning more about Tanveer’s journey? 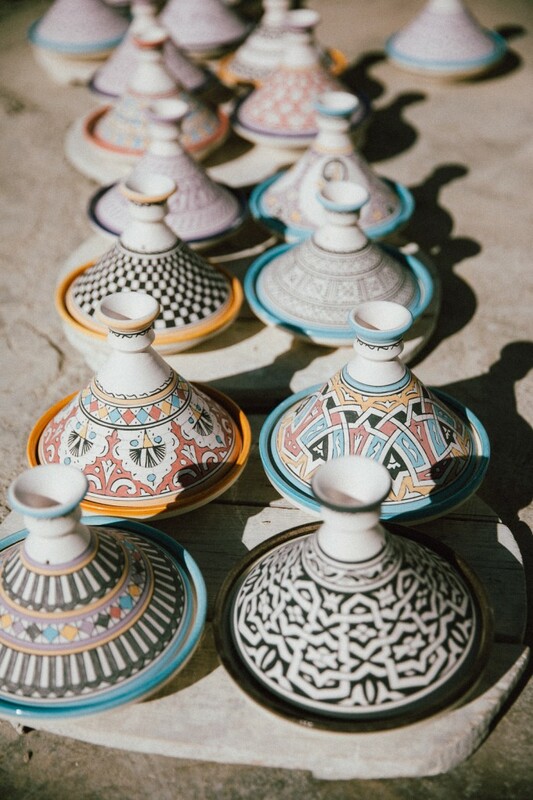 Read more about it on AFAR.com and check out Alexander+Roberts’ Morocco…From Sea to Sahara.